Have you ever wondered how it looks like in all these impressive buildings around London? Not only the Buckingham Place is open this weekend! There are another 800 buildings open like the government buildings and historic sites which are generally not seen by the public. It also allows you access to private homes, churches, schools and new skyscrapers. This architecture festival is the biggest one of its kind in the world and it only takes place on one weekend of the year! The best of it? It’s for free! There exist some popular events which are needed to be pre-booked. The entry to each building is on terms and at times specified. Here are some ideas what you could visit. For example, visit the world’s most sustainable office building! It opens the doors at London Open House 2018 for the first time to the public. There’ll be tours on Saturday (10am-5pm) and on Sunday (10am-1pm) you can use the Bank or Cannon Street tube station to get there. You should pre-book this tour here to make sure you can join it. Bloomberg is a global information and technology company and they have around 19,000 employees in 176 locations around the world. 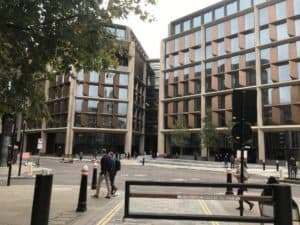 There exist only two Thai temples outside of Asia and one of them is placed in London. 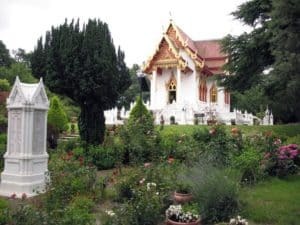 The Buddhapadipa Temple in Wimbledon will have regular tours every 30 minutes on Saturday and Sunday from 10am-4.45pm. There’s a nice garden around the temple. By the way, it’s the home of the monks and nuns, but anyone of any faith is welcome to visit it as long as they are respectful. So if you want to enter the temple, you have to remove your shoes before. Also, this one is worth to visit! It’s an office building with 24 levels. On the 7th level is a beautiful English garden terrace and form the 7th to the 24th level you can enjoy from the inside 360 views of the skyline. If you like to visit the Angel Court you should pre-book a tour of it. The tours take place only on Saturday in a 15 minutes interval from 10am-4.30pm. Probably there will be long queues so make sure you’ll be there on time. The closest station to it is Bank.